In July this year, Valentine Willie Fine Art (VWFA) partnered with Kuala Lumpur’s The Annexe Gallery to bring “BERGERak” to Malaysia. In his first Malaysian solo, Indonesian artist Popok Tri Wahyudi, uses “Jogja comic style” to create paintings which narrate the experiences of “cattle-class” airline travellers and other mass transport users. His work is accessible to a wide audience because of its familiar subject matter and simple, colorful presentation. 'Please Let Me Go', 2010, acrylic on canvas, 40 x 188 cm. Image courtesy of VWFA. The artist is one of the founding members of Apotik Komik, an artist group formed in 1997 by thirteen students from Indonesian Institute of the Arts, Yogyakarta. 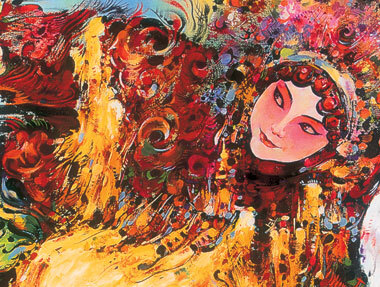 The group first created mural work and then moved into printing comics, publications more visual and alternative than what was available in Indonesia at that time. Their style, influenced heavily by popular culture, is known as “playful”. '...oops!!! ', 2010, woodcut on paper, 79.5 x 54.5 cm. Image courtesy of VWFA. He is most well known for portraying Indonesian life and political situations in a sinister comic light. However he has worked with international subject matter, most notably during artist residencies at California’s 18th Street Art Center in 2001 and the Akademie Schloss Solitude in Stuttgart in 2007. In addition to making paintings in his signature comic style, he has also worked on large scale wall art and created and exhibited three-dimensional pieces. Popok Tri Wahyudi was born in Mojokerto, East Java, in April, 1973. After a two-year trial, two Russian curators, Yury Samodurov and Andrei Yerofeyev, were declared guilty of “inciting religious hatred,” despite massive protest. Although they escaped the three-year prison sentence demanded by the prosecution, the judge declared them guilty and each had to pay a hefty fine. Critics fear the results of this trial are proof of cultural oppression in Russia. They had showcased art banned from other Russian museums in an exhibition entitled “Forbidden Art” at the Sakharov Museum. Alexander Kosolapov's 'This Is My Body', from "My Blood My Body" series, one of the works from the controversial exhibition "Forbidden Art" at the Sakharov Museum. Most media leans in favor of the Russian curators and sees the verdict as a sign of cultural oppression and censorship in Russia. However protesters from both sides were present outside the courthouse on the day of the ruling. Those offended by the paintings and who initiated the prosecution were mostly fundamentalist Russian Orthodox Christians while those against the prosecution consisted generally of artists and human rights activists. Multiple blogs and news agencies have covered the trial, ranging from arts websites to Russian interest magazines and blogs about human rights. Extreme factions from both sides have voiced their protests. The New York Times reports that radical art performance group, Voina, released cockroaches into the courtroom, an act criticized by Samodurov. According to the Associated Press, extremist members of the prosecution threatened the curators in court, reminding them of the fate of Anna Alchuk, curator of “Caution: Religion!” who was found dead in Berlin in 2008. 'Chechen Marilyn' by Blue Noses Group (2005, colour print, 100 x 75 cm), one of the works from the controversial exhibition "Forbidden Art" at the Sakharov Museum. The works in question include an icon made of caviar, a depiction of Christ with a Mickey Mouse head, and an image of Christ with the McDonald’s sign and the words “This is my body”. There were also some non-Christian symbols included in the list of offensive images such as Chechen Marilyn and the Chinese invading the Kremlin. The exhibition spurred a lot of anger amongst religious groups. Orthodox believers, as citizens of their country…have the right to protect their sacred symbols. It was not the church that initiated this prosecution, but the people who were offended. The investigation proved that the art at the exhibit was offensive towards believers, and incited religious hatred. The New York Times also mentioned, however, that Russian Orthodox Church officials believed that while displaying the paintings was criminal and the curators should be punished, they shouldn’t be imprisoned. Furthermore, the Russian Minister of Culture was critical of the prosecution. The defendants’ view is that this exhibition was a critique of the materialism of Russian society and a fight against censorship of the arts, and had nothing to do with religion. Ironically, critics fear that results of the trial have shown that censorship is quite powerful in Russia. Samodurov faced similar charges for a 2003 exhibition called “Caution: Religion!” He says the Church has reacted more strongly in the “Forbidden Art” trial. …much more concerning [than escaping the jail sentence] for people in their circumstances is what they’ve seen as a curb from their freedom of expression. Some fear a return to a cultural oppression similar to that of Czarist Russia. Some suspect the Kremlin may have had a role in lightening the punishment of the curators to prevent tarnishing their international image. Critics have predicted that people will be wary of displaying and producing potentially offensive art in Russia, and this will make Russian art less competitive globally. After growing up under Myanmar‘s military junta, Burmese artist Chaw Ei Thein‘s works is unapologetically political. In a recent interview with Asia Art Archive the artist speaks about the connection between her art and the politics in Myanmar as well as her hopes for the future of Burmese art. Although she received several art awards as a child, Thein did not pursue art as a career until after graduating university with a law degree in 1994. 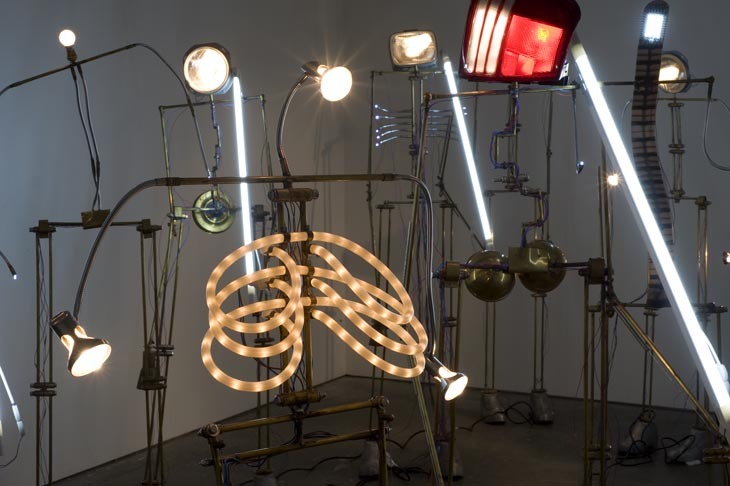 Thein became interested in performace art in the late 1990’s and began to create her own works with encouragement from more experienced performance artists. Artists Chaw Ei Thein and Htein Lin at Lin's London exhibition. In 2004, Thein took part in the Nippon International Performance Art Festival (NIPAF) which she credits as opening the door for her involvement in the performance art community. During the interview with Asia Art Archive she does not hesitate to humbly thank her mentors for such opportunities. From this point, her career as a performance artist took off. She participated in several other major art festivals such as Open in Beijing in 2007. In addition to performance, Thein maintained an interest in several other mediums ranging from painting to installation. Regardless of the medium she chooses, the political nature of her work remains a constant. At times, Thein even feels limited by her drive to reflect on the current climate in her homeland. Thein's performance piece at NARS Open Studios event in May 2010. The politcally minded Thein also elaborates on her struggles with automatic self-censorship even when working outside of Myanmar. For those artists who grew up in Myanmar and now have the chance to work abroad, concern for friends and family back home affects the kind of art they create. 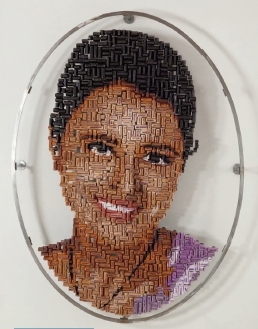 Fear of retaliation against loved ones living in Myanmar leads Thein to think carefully about what kind of art she she displays in public in any location. Chaw Ei Thein in a 2003 performance piece. Being faced with the task of connecting the creative and political aspects of her art, Thein has developed ways to show subtle but powerful connections between the two. Though the artist worries that some of these connections may be lost on Western audiences, the conditions in Mayanmar are on her mind daily and show up in her art just as often. It is clear that the artist also has a passion for art education, a field that she feels is underdeveloped in Myanmar, especially in rural areas. In addition to preparing for upcoming shows, including a collaborative show with Htein Lin in November, Thein’s current activities include readying her second children’s’ book on art. When asked by Asia Art Archive what she would improve in Myanmar’s art scene Thein’s answers reflect her desire to bring art to the people. Chaw Ei Thein, 'HeShe I', acrylic on paper, 2007. Even with all of this, Thein doesn’t take herself too seriously. She is constantly moving from city to city, still unsure of where to settle down and seemingly not too anxious to make this decision. For her, art is not about formality or rules, it is simply about making the art that she wants to create. Whether people applaud her or not, she continues to create powerful and moving pieces on her own terms. “Seeing One’s Own Eyes“ is the first European exhibition by MadeIn, a new artists’ collective founded in 2009 in Shanghai by Xu Zhen (b. 1977, Shanghai), often heralded as one of the most important and renowned conceptual artists to have emerged from China since the 1990s. 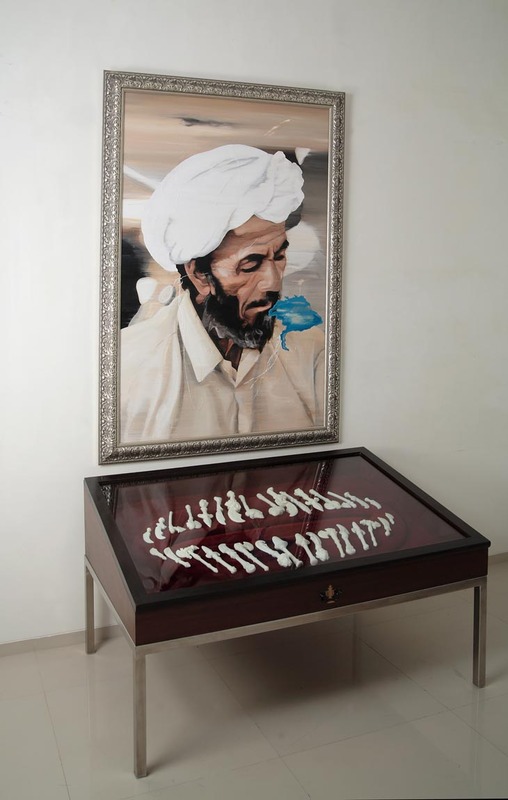 While the work is all made in China, Madeln impersonates a fictional group of Middle Eastern artists, creating a kind of exhibition in disguise, “an exhibition of an exhibition.” The use of this technique enables Xu to play down his personal identity. Derived from “Made In”, two words that refer to manufacturing (with country of origin not specified), the name Madeln also phonetically translates into Chinese for “without a roof ” (‘méi d˘ı∙ng’), suggesting an openness to the collective’s work. Through a range of media including sculpture, video and mixed-media installation, Madeln presents clichéd images of the Middle East, as a war-torn part of the world, associated with the oil industry, death, violence, human suffering and religious conflict. By raising issues of cultural perception, the exhibition encourages us to take a clearer view of current affairs in that region of the world. The most recent work titled Hey, are you ready? (2009–2010) comprises of three large white sculptures made from polystyrene, one of the many by-products derived from the distillation of oil. These objects form neat, crisp packaging for the protection of loaded symbols including mosques, crescents, oil barrels and Kalashnikov rifles, revealed by negative space. Spread (2009), a series of wall hangings covered with cartoon imagery, deal explicitly with the geographical politics of Israel, Palestine, Iraq, Iran, Afghanistan, China, Europe and the USA. Key political figures and scenarios are starkly drawn and exaggerated to billboard proportions, provoking and highlighting the often unconstructive and negative debates that are encountered in this area. 'Spread' by Madeln (2009), mixed media on canvas. Courtesy the artist and ShanghART Gallery. In Perfect Volume (2009) the toe-ends of combat desert boots create a circle on the floor representing a row of absent soldiers as imagined casualties. This references the eternity and infinity of the circle, and is further depicted in the piece Machine for Perpetual Motion (2009), a model of an oil pump, constructed meccano-style but made from razor wire. The energy needed for its movement is blatantly taken from an electrical socket. The illusionary installation Calm (2009) is made of building debris, a carpet of bits of brick and rubble that is still at first glance. Slowly it reveals itself as animated, gently moving up and down as if it were breathing like the survivor of a bomb blast, trapped and awaiting rescue. This notion of destructive power also features in the low-level floor-based installationThe Colour of Heaven (2009), where mushroom clouds from atomic bomb explosions are placed under assorted glasses. 'The Colour of Heaven' by Madeln (2009), glasses, painting. Courtesy the artist and ShanghART Gallery. The title of this exhibition refers to a verse in the Koran, “My way, and that of my followers, is to call you to God, on evidence as clear as seeing with one’s own eyes” (Sura 12, verse 108). Freely translated it is an opportunity for to reflect, a consideration of how we see – by “seeing one’s own eyes” – as much as what we see. “Seeing One’s Own Eyes” is a collaboration with S.M.A.K. (Belgium) and is on display at the Ikon Gallery, Birmingham, UK, until 11 July, 2010. 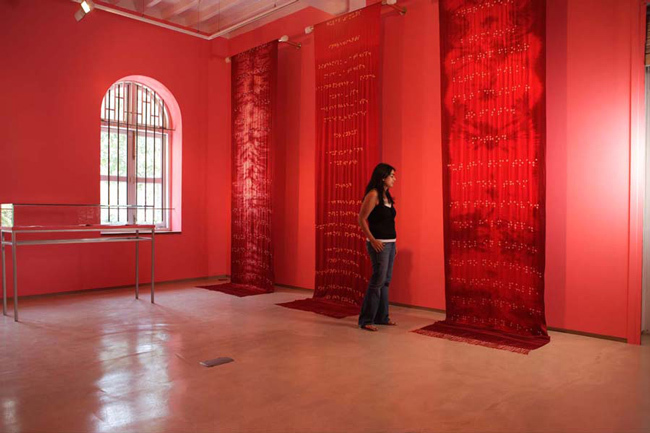 Reena Kallat (1973) is one of the best-known Indian contemporary artists today. In this Art Radar Asia exclusive interview she discusses her influences, artists she admires, the contemporary art scene and the painstaking techniques used to create her renowned rubber stamp portraits. Kallat has shown her work in many prestigious institutions including the Saatchi Gallery and Mori Art Museum in Japan. Where were you born, brought up and schooled? I was born in Delhi, although I was brought up in Mumbai all through my growing years where I went to school, followed by my training at Sir J.J. School of Art. What have been major influences in your life and art? If I had to think of one person who influenced my life tremendously, it would have to be my mother who helped inculcate several interests at an early age. Although she died when I was young, her absence continued to influence my life in more ways than one. There are several artists whose works have impacted my Art and my sensibilities towards art making at different stages that include Frida Kahlo, Rachel Whiteread, Jenny Holzer, Mona Hatoum, Christian Boltanski, while closer home in India the practices of artists such as Nalini Malani, Vivan Sundaram, Arpita Singh, interested me and informed my early years. How long does it take to produce an artwork? What kind of space do you work in? I like working on multiple ideas at the same time and these could be at different stages of completion. Sometimes they collectively spark off unexpected adaptations. Most are kept fluid and provisional over a period time to see if they spawn into meaningful works. My studio is on 2 levels, ground and first floor. I usually make work on the lower level and have my books to read, write or sketch on the upper level which allows me the space and sometimes necessary distance between conceiving an idea and realizing it. What achievement in your art career are you most proud of? Although there is a lot to be achieved I’m not someone who’s easily satisfied, given the expectations I have from myself. But to be a catalyst in realizing certain key works that have taken me a period of time to develop, such as the series of “Synonyms” made using rubberstamps, “Walls of the Womb” a series of tie and dye silks or the sculptural installation titled “Saline” made in bonded marble amongst others, has been fulfilling. I am glad to have been part of some interesting shows in venues such as the Helsinki City Art Museum, ZKM museum in Karlsruhe, the Chicago Cultural Centre, Hangar Bicocca in Milan, Zendai Museum of Contemporary Art, MOCA Shanghai, Henie Onstad Kuntsenter in Oslo, The National Gallery of Modern Art in Mumbai and Saatchi Gallery, London amongst others. Are there any Indian artists you admire in particular? Amongst the long list of artists from India whose work I have admired are Nasreen Mohamedi, Nalini Malani, Vivan Sundaram, Arpita Singh, Bhupen Khakkar, Gulam Sheikh, Nilima Sheikh, Atul Dodiya, Sheela Gowda, Surendran Nair besides some of my contemporaries like Anita Dube, Subodh Gupta, Jitish Kallat, Bharti Kher, Shilpa Gupta and N.S. Harsha. We have been to the Saatchi show in London several times, and noticed that your art displayed there has been deeply influenced by historical events. How does history especially that of India, inspire you? I think it is almost impossible to not be influenced either consciously or unconsciously by the richness of India’s vast cultural landscape through its architecture, film, crafts, dance, theatre. As we know, India has had long phases in its history of harmonious co-existence among divergent ethnic groups and communities, however in the recent past its political history has been tainted by divisive politics being played out, causing fissures amongst people. At times my work can be a comment or a critique but what interests me is that space in-between the factual and the fictional, of the sometimes harsh realities and the tender aspirations or dreams for a better future. Could you please tell the story of how your Synonym (2007) came about? Why did you create it? How was it made? My interest in using rubberstamps as a medium grew out of its use within official purposes and it’s associations with bureaucracy. I first started using them in 2003. I think of each name on the rubberstamp as being representative of an individual amidst hundreds of faceless people in this vast ocean of humanity. The sources of reference for the names often provide meaning or give context to the different bodies of works made. In case of the Synonyms I chanced upon the list of names, out of official police records of those who’ve gone missing in India, through a friend who was looking for someone missing. 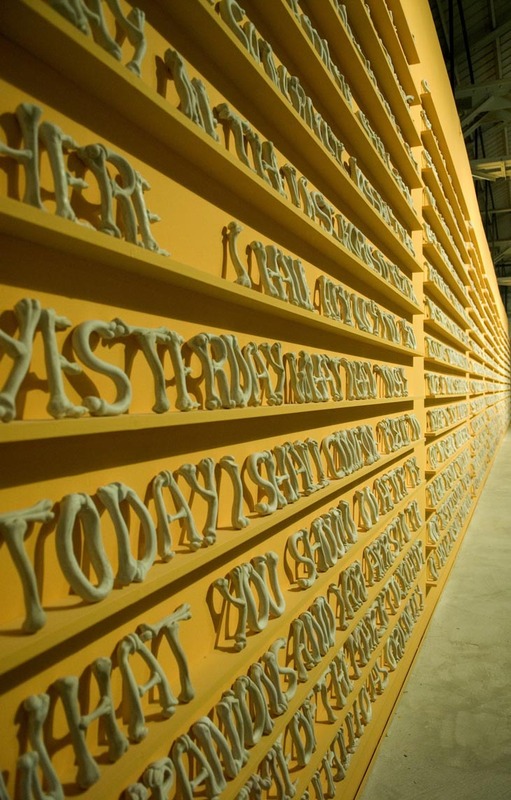 The work stands like a screen holding up portraits formed by several hundred names of people rendered in scripts of over 14 Indian languages. From a distance they come together as portraits, but up-close they almost seem like a circuit-board of rubberstamps. These are people who seem to have slipped out of the radar of human communication, thrown off the social safety net. Making these works is a slow process but one that throws up sometimes unexpected and startling results. I first draw out the silhouette of the portrait on plywood, then arrange the wooden pieces that comprise the rubberstamps. After painting the portrait on the uneven surface of the rubberstamps, the names are pasted and inked. These pieces are then transferred onto the Plexiglas where some additions and omissions lend the portrait its final character. What are your future plans? Exhibitions? I am toying with a bunch of ideas at this point, some of which are slowly taking shape in the studio while there are practical glitches in case of others that make the process equally challenging as it is exciting. Amongst some of the exhibitions I’m now making new work towards are for the Helsinki City Art Museum, Castel Sant Elmo in Naples later this year and the Kennedy Centre in Washington, scheduled early next year. What are your thoughts on the contemporary Indian art scene in both the Indian and international contexts? I think post independence it has taken a long time for India to find its place in the larger global context in most fields. Contemporary Indian Art has experienced a steady growth over the last few decades with contributions and efforts from previous generations of artists, writers, critics into developing the scene before its meteoric rise, largely attributed to the commercial success it was gaining. Given the collective vibrancy and sheer robustness of the Art being produced here, I think individual artists from India will increasingly be seen to be significant contributors to the global Art scene. In the absence of the state’s responsibility in contributing to improve and enhance the infrastructure around Art, whether it is at the university level or at the institutional level, the private sector in India has played an important role. However there is still a lot of work that needs to be done to try and increase the presence of Art in the larger public consciousness. Subscribe to ArtRadarAsia for more artist interviews. In a recent editorial in the Taipei Times, J. Michael Cole develops this notion further, discussing the possibility that Beijing is beginning to proactively and openly push Chinese culture into Taiwan, hoping to increase acceptance of its “one China” policy. 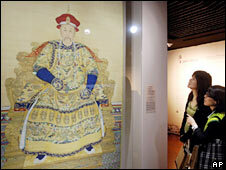 You can read the full editorial on the Taipei Times website: Beijing sees culture as a weapon J. Michael Cole, 5 March, 2010. Prominent Chinese artist Ai Weiwei will be the next artist in the Tate Modern’s Turbine Hall for the Unilever series (12 Oct 2010-25 Apr 2011). He will be the first artist from the Asia-Pacific region to undertake an installation there. 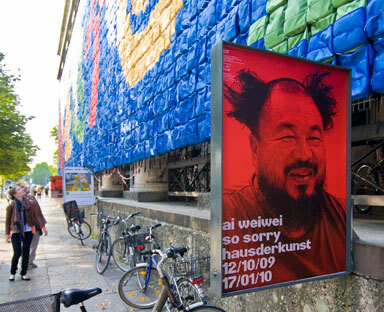 In the past year, Ai Weiwei has created the installations Remembering 2009, a memorial to schoolchildren who were victims in the 2008 Sichuan earthquake, and Soft Ground 2009 in the Haus der Kunst in Munich. He has also had a solo show at the Mori Art Museum in Tokyo. Click here for more information at Art Knowledge News. Subscribe to Art Radar Asia to learn more about contemporary Asian artists. Hong Kong: a Chinese city, a territory, a post-colonial state. Since China regained sovereignty of the area from Britain in 1997, Hong Kong has been struggling to define its identity. 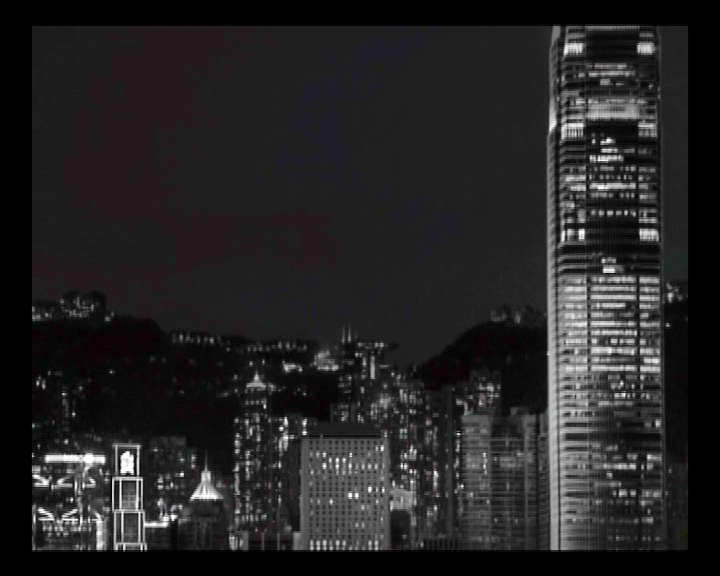 In the internationally touring video programme, This is Hong Kong, participating artists have used moving image to provide a visual portrait of today’s political, social and architectural Hong Kong. Hong Kong’s recent history has been very different to that of mainland China; from the mid-1800s to 1997 it was under British rule. Now returned to Chinese control, the territory is struggling with issues of identity common to many postcolonial states. It is in a unique position, as China has continued to allow the “special administrative region” cultural and economic freedoms that are not available on the mainland. This is Hong Kong aims to show just how different the area is from the mainland and sees moving image as the medium with which to do it. 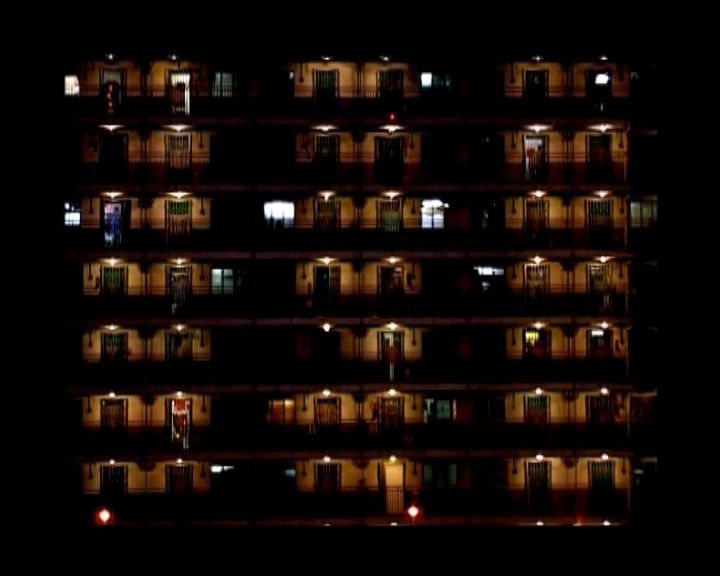 It showcases 16 video works by 15 contemporary Hong Kong artists; these renowned artists are Chow Chun Fai, S.T. Choi Sai Ho, Silas Fong, Ip Yuk-Yiu, Linda Lai, Leung Mee Ping, MAP Office, Adrian Wong, Kacey Wong, Woo Ling ling, Ban Zhang, Kingsley Ng, Hung Keung, Leung Chi Wo and Chilai Howard Cheng. The four sections of the exhibition, (Transitional) Architecture, Diaries, Fictions and Tactile Positions, each deal with a different side of the city, and represent the different strategies developed by the artists. Images of traditional neighbourhoods, unique architecture, underground communities, postcolonial identity and “life in the big city” all combine in videos with strong, compelling soundtracks. This is Hong Kong helps the viewer to build an overall picture of what it’s like to live in one of the most important economic and cultural metropolises in the world. This is Hong Kong is supported by Hong Kong-based Para/Site Art Space, a non-profit art organization headed by Executive Director and Curator, Alvaro Rodriguez Fominaya. Fominaya is also the curator of the exhibition and believes it “is a great opportunity to show at an international level the vibrant art scene of Hong Kong”. After being successfully shown at LOOP Festival in Barcelona, Spain, the programme made its way to LOOP Alternative Space in Seoul, Korea, Hamburg’s Subvision Festival, EastSide Projects, Birmingham, and IFA Gallery, Berlin. This is Hong Kong is currently showing at the Kuandu Museum of Fine Arts in Taipei, Taiwan, and will conclude at Kunsthalle Wien, Austria, in March this year. Visit the exhibition page on the Para/Site Art Space website for more details on individual videos. Curator Alvaro Rodriguez Fominaya can be contacted directly through this site. Fominaya also writes his own informative blog – visit it here. “The Empire Strikes Back: Indian Art Today” opened on 28 January 2010 at Saatchi Gallery in Chelsea, London. 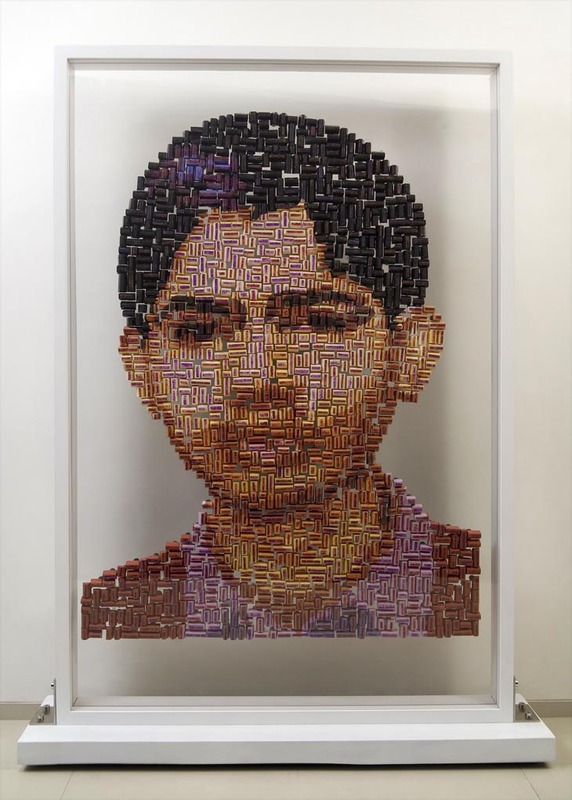 It has received attention from critics interested in both the cultural implications of contemporary Indian art in British society and the exhibition’s impact on the art market. Intensity and violence are found in some stand out works but the consensus suggests an uneven show. According to the Business Standard, over 100 works of 26 Indian artists are being displayed. Price estimates are included for some works. Also concerned with the art market, Colin Gleadell of The Daily Telegraph contemplates the impact of “The Empire Strikes Back” on the value of Saatchi’s investment in Indian contemporary art. He also summarises the fluctuations in the Indian contemporary art market. Generally, critics’ reviews have been mixed: though they support the concept of showing contemporary Indian artists, many claim that there are only a few standouts. The Financial Times‘s Peter Aspden is intrigued by “contrast between the work’s wholesome message and the gruesome imagery used to deliver it” in Jitish Kallat’s Public Notice 2, the first work in the show. He then interviews Rebecca Wilson, the associate director of Saatchi Gallery. She explains Saatchi Gallery’s reasons for organising the show, focusing on global trends regarding Indian and Pakistani contemporary art and the sheer volume of new artists from the region. JJ Charlesworth of Time Out London also concedes that there are works of “bog-obviousness,” but especially praises Chitra Ganesh’s Tales of Amnesia, consisting of 21 comic-inspired prints that question the role of femininity in society. 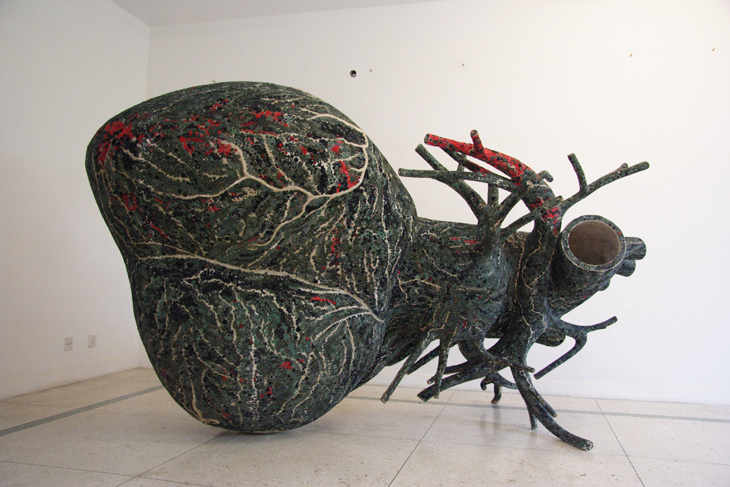 Luke is especially interested in Bharti Kher’s An Absence of Assignable Cause, which is her conception of a sperm whale’s heart covered in bindis. Mark Sheerin of Culture 24 is also struck by the intensity present throughout the works. He claims that, “At best, such high impact work can astound and violently re-orient you” and cites Tushar Joag’s The Enlightening Army of the Empire’s “skeletal, spectral band of robotic figures” as a prime example.